Now you can entertain in style, thanks to the Op-La Tray/Table. Designed by Jasper Morrison, this incredibly versatile ornament includes a stylish tray crafted from ABS, complete with two handles built into the design, as well as a stainless steel base. The Op-La allows you to remove the top tray and serve, with the two handles allowing for easy portability, and when you’re done, simply return the tray the top of the stand and transform it into a makeshift table! Tray is crafted from ABS. 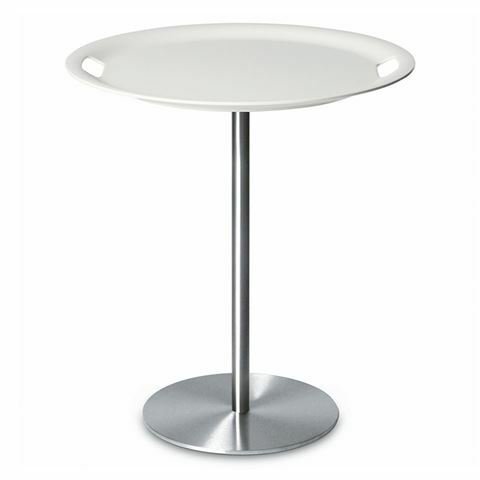 Base is crafted from 18/10 stainless steel. Two-in-one object can be used as a tray, or as a table. The top tray comes off the base with ease. Tray features two handles built into the design for easy portability. Return the tray to the base to become a makeshift table.